Despite her success as a spy, Jane Bonde is still beholden to strict social mores, so when her spymaster uncle pressures her to marry enigmatic Dominic Griffyn, she's totally conflicted. Bonde, Jane Bonde, has trained from a young age to be the best spy England’s supersecret Barbican group has to offer. On an intellectual level, she understands her uncle’s desire to see her married, since it’s difficult to navigate society as a single young lady. However, to be ordered to marry a man she’s never met gets Jane’s back up. Then, when she meets the darkly handsome Griffyn, she finds him wildly attractive, which is a wholly unwelcome distraction, since she's trying to vanquish the evil villain Foncé, who's sworn to destroy the Barbican group and bring England to its knees. At first, Griffyn is against marrying her, too, but everything about him is a mystery, and if there’s one thing Jane can’t resist, it’s a puzzle. Of course, the fact that his kisses drive her crazy doesn’t help, and then there’s the way he steps up to every challenge; better than some men trained for years to control the chaos and danger of her field. For his part, unsavory events from Griffyn’s childhood mire him in guilt and feelings of unworthiness, and he has convinced himself he will never marry. But the exquisite and exceptional Jane may be just the woman to treat his psychological wounds, if they can defeat the maniacal Foncé and forge a future together. 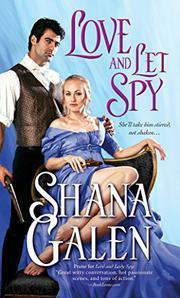 Galen pens a delightful, entertaining James Bond homage in her newest spy-based Regency romance; from the very first 007-inspired chase scene, we're hooked by the adventure and physical jeopardy, and we keep reading for the emotional risks and high-stakes love story unfolding between Jane and Griffyn. The fun, ebullient spy-driven plot is gratifyingly over-the-top in a Bond-movie way, while the romantic arc remains authentic and affecting.